Is The US Nation Building In Syria? Military operations, aid coordinating and infrastructure projects all point to signs of U.S. nation building in war-torn Syria. The new U.S. strategy in Syria includes: bringing back water and electricity, getting kids back into schools, reopening hospitals and training security forces. It sounds a lot like low-key nation building, something experts pointed out. But according to Secretary of State Rex Tillerson, it's not. In a speech at Stanford University in January, Tillerson said, "We must be clear: Stabilization is not a synonym for open-ended nation building or a synonym for reconstruction." But here's the thing: The goals the U.S. wants to achieve in Syria all require the kind of stuff that makes up nation building, just on a smaller scale. Let's break that down. Getting rid of ISIS and Al-Qaeda requires training local forces, something that takes time and boots on the ground. In January, the U.S. anti-ISIS coalition said it was planning to train 30,000 members to be stationed throughout northeastern Syria. Getting refugees and internationally displaced people back home requires rebuilding city infrastructure and securing territory. 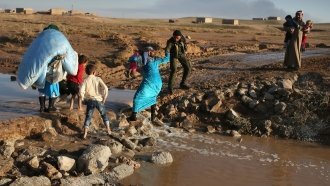 The city of Raqqa was devastated while being retaken from ISIS, and the city has a long way to go before even basic necessities, like water and electricity, are back. If the U.S. doesn't want Syrian President Bashar al-Assad to be in power, that requires rebuilding state institutions that can then transition into part of the new government. These institutions will be vital for the U.S. for distributing aid throughout the territory and ensuring long-term stability. As much as Tillerson wants to set stabilization efforts apart from nation building, those two things are hard to separate. The new Syria policy he's outlined has all the parts of nation building, except it's on a more localized scale, taking place in northeastern Syria instead of being a country-wide effort.